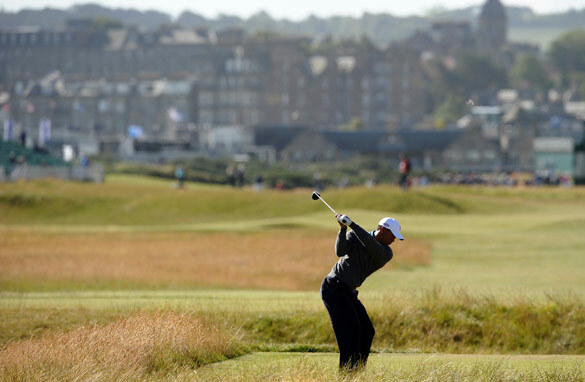 St. Andrews, Scotland (CNN) - There is pretty much only one thing you can guarantee ahead of the Open Championship at St. Andrews: it is going to be windy and cold, and will rain at times. As for who is going to win from the field of 156, it’s been a while since I have covered a British Open and thought that no-one really stands out. Tiger Woods goes in as favorite, because he always does, and he won in 2000 and 2005 by multiple shots on the Old Course , but that's about it for reasons why he should take the $1.3 million first prize this year. Okay, I’ll accept he is world number one and bagged 14 majors already, but that was back before the meltdown in his personal life. He’s changed his putter for the first time in 11 years, which was the headline-making announcement by Tiger in relation to his approach to the third major of the year. He has been nowhere near as meticulous in studying the course layout. Maybe he thinks he knows enough about it, we shall see. The Europeans are in hot form, but there are so many of them who have been impressive since the first major of the year that it really is a lottery. World No. 2 Phil Mickelson, who is yet to fully grasp links golf despite his love of the style, is a chance of course. The American played a practice round with Nick Faldo, who won The Open at St Andrews in 1990, to learn more about the right angles from which to approach the undulating greens. The Royal and Ancient Golf Club, whose home is at the home of golf, has added only 45 yards to the course. The infamous road hole, the par-four 17th, has been marginally stretched and that is about it. The R&A prefers to let the wind that zips off St Andrews Bay keep the players on their frozen little toes. I think age and experience will come to the fore with the tricky conditions. By that I mean I can see an Englishman like world No. 3 Lee Westwood, despite his calf injury, taking the title. I remember when Padraig Harrington complained of his wrist injury at Birkdale in 2008 and nearly pulled out. He went on to win it for the second time after surviving treacherous playing conditions. Maybe I am grasping at straws looking for a winner, but I have to because it’s so wide open, and that means it should be a great week of golf with many twists and turns. I would like to see Tom Watson going for it. The weather might help him, since it will be more about the quality of the game and not the length or brut force. However I agree anyone can make it this time, having said this I believe Tiger is finally back with these British Open, does not mean he will win it, but I am certain he is back. Come on tiger I'm pulling for you! Shut the critics up..
Tiger Woods will win British Open by 2 strokes. Prevailing weather condition may help Tiger. No golf tournament is complete without the participation of Tiger wood and world has witnessed that. Let him play and he should use straight putter rather twisted which has been cleverly open angled by his enemies! Perhaps he does not know? I think he puts his putting in glamour’s way which he was doing six months ago from today. I would be watching him and praying!